I’m all about the easy dinner ideas. Anything from the crockpot is awesome! I just come at lunch from school and throw the food in the crockpot and turn it on low. It’s so nice and easy I can’t even tell you how much I we loved this meal. We have left overs but it was so good I want it tomorrow for lunch if Matt doesn’t beat me to it! 1. Preheat oven to 425 degrees. In a medium bowl mix together all of the ingredients for the meatballs. You will want to use your hands to mix them together well. Separate into golf ball sized meatballs. Place on a cookie sheet, then bake for 20 minutes. 2. When the meatballs are done baking allow to cool completely and place in a gallon sized freezer bag. Place in the fridge or freezer depending on when you would like to make it. 3. In a medium sauce pan whisk together all the ingredients for the sauce. Bring to a boil on medium heat, continue to stir until the sauce thickens. Set aside to cool. Place in a bowl or bag and in the fridge until you are ready to use. 4. Cut of the green peppers. Place frozen meatballs into the bottom of the crockpot and dump the sauce on top. Then put cut peppers on top. Cook on low for 6 to 8 hours or until meatballs are heated through and the peppers are tender. 5. The last 30 minutes add your pineapple. Serve with rice! Enjoy!! 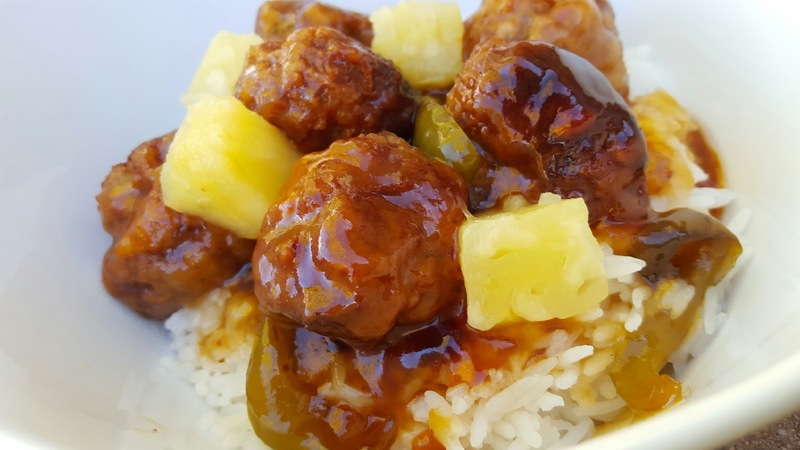 I love quick and easy and I love the crockpot! 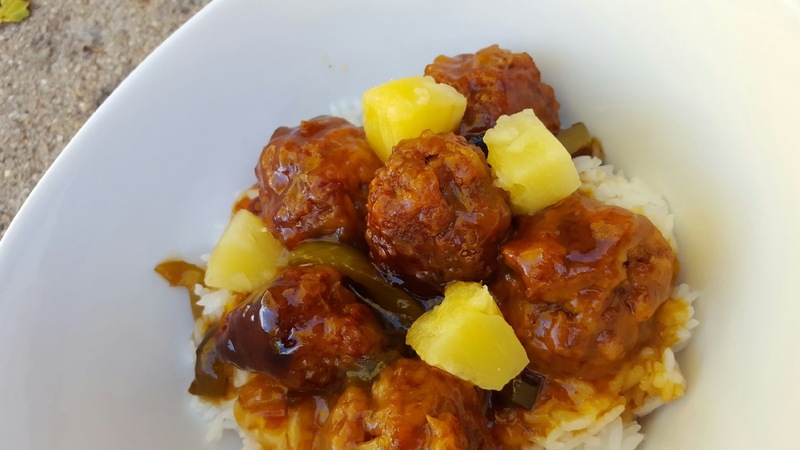 I've done meatballs in many ways but never Hawaiian style! Pinning this! Thanks for the recipe! LOL And winter is coming anything that makes me think of sun and beaches is my kind of meal!!! Great Meatballs, they look soooooooo good! Thanks so much for sharing with Full Plate Thursday and have a great day! Great Recipe!! Thanks for sharing on My 2 Favorite Things on Thursday!! Hope to see you again this week!! Pinned! These look delicious! 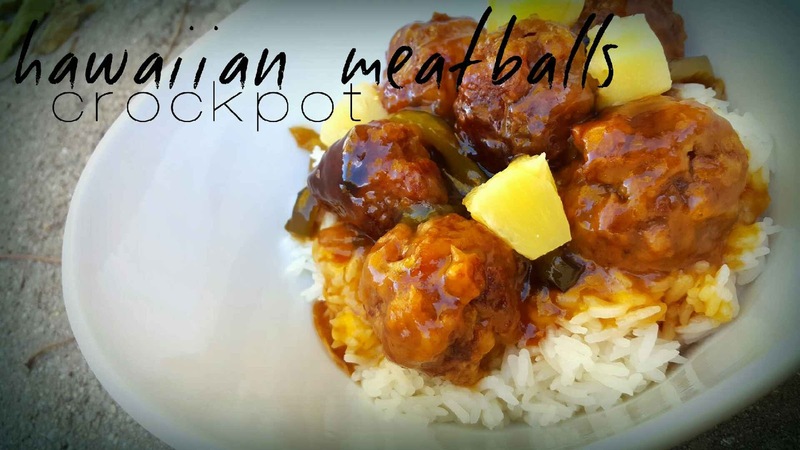 I love making meatballs in the crockpot — so quick and easy!